To cooperatively work on a better future, we need organisations to open their doors for this united cause. The youth conference "FUTURE(T)HERE" is supposed to be the beginning of a new movement. The first Youth Conference on Sustainable Living took place in November 2016 in Mumbai. The second one was held at the new premises of the Goethe-Institut / Max Mueller Bhavan Kolkata in January 2018. While Indian students and some German speakers participated the first two events, the 3rd conference (June 2018) went one step further: For the first time, Indian and German students met in Düsseldorf, worked together in bi-national groups and used art to create an image of their shared future. ‘How do we want to live together in the future? How can we shape a sustainable society? 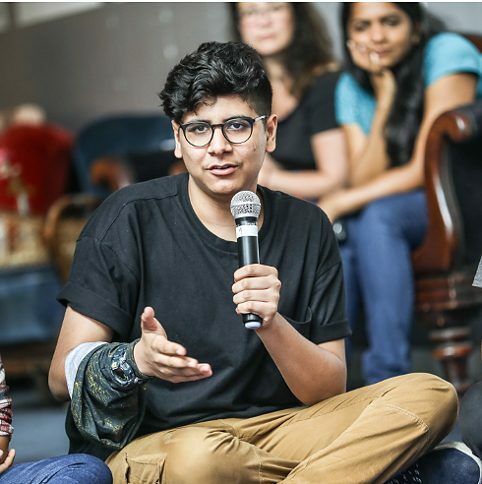 What makes us happy?’ Thirty young people from Mumbai, Kolkata and Düsseldorf engaged with these important questions during a youth conference titled Future (t)here, held between 8–11 June 2018 at the performing arts theatre, Junges Schauspiel Düsseldorf. FUTURE (T)HERE, the first Youth Conference on Sustainable Living took place just a few days back in Mumbai. 120 Students from 17 government, public and private schools were invited to explore and exchange their ideas and hopes for a better future.